🐌🐌🐌🐌🐌 5 out of 5 snails… I mean stars! 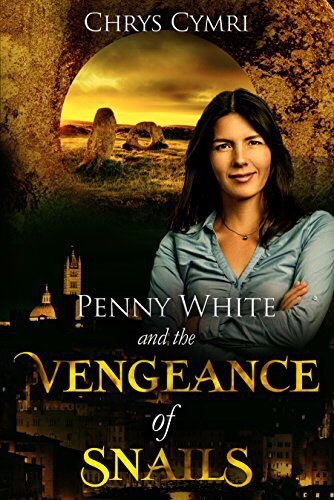 This fourth installment of the Penny White series is an absolute treat! Vengeance of Snails opens with Morey and Taryn about to become parents, Clyde eager for his confirmation, James slowly and morosely recovering from his near-fatal heroics, and Penny and Peter starting in on their wedding plans. It’s just life as normal since Penny involved herself with the denizens of Lloegyr. And, as always, there’s no smooth sailing for our dauntless Father Penny! Trouble is brewing in the shape of unexplained vandalisms at a number of sites linked to Penny as well as growing issues with snail sharks in both our world and Lloegyr. James has never been one of my favorite characters, but this book pulled him up quite a bit in my esteem. After some woe-is-me shenanigans, James has something happen (no spoilers!) which leaves someone utterly dependent upon him. Watching James grow into that role was lovely. And his paternal instincts! I might’ve actually swooned a little. Peter, Raven and Morey are steadfast, as always. The tension between Penny and Raven, as well as Peter’s trust in the search dragon were delicious. The biggest character arch in this episode involves, as the title suggests, dear little (or maybe not so little anymore) Clyde. As we learn more and more about snail shark society in Lloegyr and the two factions, Clyde is faced with a temptation few could resist, and a huge decision weighs heavily upon his left-spiraling shell. What will he decide? How will Penny cope with his decisions? And can their mother-child bond survive when Clyde finally learns the truth about what happened to his real mum? Fans of this series are sure to be delighted by Vengeance of Snails. I know I certainly was! Grab this new release today, available in Kindle Unlimited too, from Amazon HERE﻿.